The Anatolian Peninsula is located at the confluence of Europe, Asia, and Africa and houses 81 cities of which 79 of them have population over 100,000. We employed some criteria to select the cities from the 81 cities. After accomplishing all the criteria, eight cities were remaining for the study. Nonparametric Mann–Kendall test procedure was employed for the urban and rural stations of these cities to detect the long-term change in temperature trends. Statistical analysis of daily minimum temperatures for the period between 1965 and 2006 suggest that there is no statistically significant increase in rural areas. In contrast to the findings of the previous studies, however, all the urban sites and difference between urban and rural pairs show significant increase in temperatures, a strong indication for the existence of urban heat island (UHI) affect over the region. 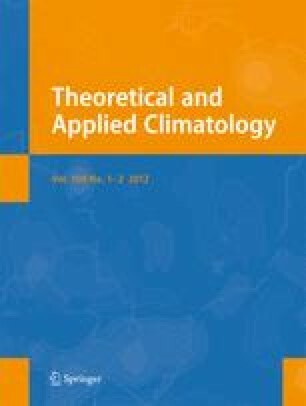 Regional Climate Model was also utilized to assess the changes in temperature by the end of century for the region. The findings suggest that an increase of up to 5°C is possible. Climate change effects enforced with UHI have the potential to cause serious problems for the entire region and hence needs to be studied thoroughly. This study is partly supported by a grant (108Y064) from TUBITAK (The Scientific and Technological Research Council of Turkey).